Think about the feeling you get behind the wheel. The sense of authority, of deliberate motion. Recall how your hands orchestrate every maneuver. It’s a good feeling. Relive the sensation each time you wear the TAG Heuer Men’s Grand Carrera Grand Date GMT Automatic Watch WAV5111.FC6225. Inspired by GT race care engine design, this striking timepiece projects authority and discipline. The Grand Carrera collection exemplifies precision timekeeping and sleek design, and this timepiece—with its unique rotating system and modern dashboard design—lives up to the reputation. Black alligator straps hug the 42.5 mm fine-brushed steel case and bezel, whose polished edges accentuate the silvered hour markers. Custom luminescent hands rest against the smooth black dial that breaks into ripples like the surface of a once glassy pond. A second time zone gives demonstrates this piece’s practical innovation. Along with the GMT feature comes a standard date display and water resistant seal. This timepiece’s automatic movement keeps battery replacement off your “to do” list, while regular wear and arm movement keep this watch telling you the time without winding. Sapphire crystal in the case’s front and back showcase both the dial’s décor and the Calibre 8 RS movement’s gears. With a frequency of 28,000 vibrations per hour, the second hand dances effortlessly across the hours. Celebrities like Brad Pitt, Leonardo DiCaprio, and Tiger Woods are no strangers to the TAG Heuer brand. Matthew McConaughey in The Lincoln Lawyer wears a Grand Carrera on his wrist for the film’s duration. Even if you’re unmoved by celebrity endorsements, there’s little reason to set this timepiece aside—unless the price range deters you. Still, if you want sportier features, the Aquaracer collection features enhanced water resistance and stylish, turning bezels. The Monaco collection’s chronographs will let you stop time if so desire, but Grand Carrera line itself offers similar variety, but with its distinctive look and luxury materials. Adding the chronograph function within the Grand Carrera line changes the clean look of the dial and increases the price tag anywhere from $500 to $3,000 more, depending on the materials and features you add. 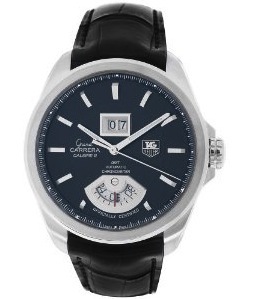 At $5,100, the TAG Heuer Men’s Grand Carrera Grand Date GMT Automatic Watch WAV5111.FC6225 is well suited to stand time’s tests across multiple time zones, and it provides a clean and powerful option for any determined and distinguished gentleman. If determination, refinement, control, and discipline are words that define you, TAG Heuer designed a watch to match in the Men’s Grand Carrera Grand Date GMT Automatic Watch WAV5111.FC6225. At $5,100, the investment is significant, but full of rewards. Online retailers will also reward your choice of this timepiece by dropping prices as low as $2,630. You’re out of reasons to delay. See how this timepiece feels in your hands.